According to the United States Census Bureau, the city has a total area of 10.99 square miles (28.46 km2), of which, 10.87 square miles (28.15 km2) is land and 0.12 square miles (0.31 km2) is water. On July 3, 1829, Horace Blackman, accompanied by Alexander Laverty, a land surveyor, and an Indian guide forded the Grand River and made camp for the night at what is now Trail and N. Jackson Street. They arrived in Jackson on a well-traveled Indian trail leading west from Ann Arbor. Blackman hired Laverty and Pewytum to guide him west. Blackman returned to Ann Arbor and then Monroe and registered his claim for 160 acres (65 ha) at two dollars an acre. Blackman returned to Jackson in August 1829, with his brother Russell. Together they cleared land and built a cabin, built on the corner of what would become Ingham and Trail streets. The town was first called Jacksonopolis. Later, it was renamed Jacksonburgh. Finally, in 1838 the town's name was changed to simply Jackson. Jackson is one of the birthplaces of the Republican Party. Undisputed is the fact that the first official meeting of the group that actually called itself "Republican" was held in Jackson under the Oaks on July 6, 1854. A Michigan Historical Marker at what is now the northwest corner of Second and Franklin streets in Jackson commemorates an anti-slavery county convention on July 6, 1854. Meeting outside to avoid a hot, over-crowded hall, the group ultimately selected a slate of candidates for state elections. The marker identifies this as the birth of the Republican Party. The site, an oak grove on "Morgan's Forty", then on the outskirts of town, became known as "Under the Oaks". Jackson was an early home to the automobile parts industry. Even before Detroit began building cars on assembly lines in 1910, Jackson was busy making parts for cars and putting them together. By 1910, the auto industry became Jackson's main industry. Over twenty different cars were once made in Jackson. Including: Reeves, Jaxon, Jackson, CarterCar, Orlo, Whiting, Butcher and Gage, Buick, Janney, Globe, Steel Swallow, C.V.I., Imperial, Ames-Dean, Cutting, Standard Electric, Duck, Briscoe, Argo, Hollier, Hackett, Marion-Handly, Gem, Earl, Wolverine, and Kaiser-Darrin. Today the auto parts industry remains one of the largest employers of skilled machine operators in Jackson County. In 1914 George Todoroff founded the first coney island restaurant and created his famous coney island hot dog topping. His coney island restaurant was located directly in front of the railroad station located on East Michigan Ave and was open 24 hours. The restaurant proved to be a popular dining option for rail passsengers and over the course of 31 years George sold over 17 million coney dogs. Today two coney island restaurants unaffiliated with Todoroffs sit in a building near the train station on East Michigan Avenue. In addition to this several area restaurants throughout the Jackson area offer their own version of the coney island hot dog, or just "coney" as referred to by local residents. Jackson's version of the coney dog is distinctly different than what you will find at Detroit area coney island restaurants as well as other coney island restaurants throughout Michigan and the midwest. Michigan's first state prison was approved by the legislature in 1838. A temporary wooden prison, enclosed by a fence of tamarack poles, was built on sixty acres donated for that purpose inside the city limits of Jackson. In 1839 the first thirty-five prisoners were received. A permanent prison was built three years later. Beginning in the 1850's under Warden H.F. Hatch a greater emphasis was placed on the education and rehabilitation of prisoners. After 1934 the inmates were housed in the new prison just north of Jackson's city limit in Blackman township. Tours are available today of the original prison site on Cooper St. inside the city limits as well as at the portion of the facility that is no longer actively used to house prisoners just north of town. 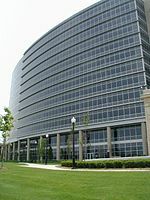 Three major private employers in the city are CMS Energy, which provides natural gas and electrical services to much of Michigan and has its international headquarters in the city, as well as Allegiance Health (formerly Foote Hospital) and the Eaton Corporation. Michigan Automotive Compressor, Inc. (MACI) is the largest manufacturer in Jackson County and its fourth-largest individual employer. However, in February 2009 it began offering voluntary buyouts to its workers, in reaction to the slowing economy. Jackson is also home to a state prison complex, which includes a building once known as the largest walled prison in the world. Portions of the prison complex closed in 2007, including the Annex of the Charles Egeler Reception and Guidance Center Annex (RGC) and the Southern Michigan Correctional Facility (JMF). However, the five other facilities in the complex, including two in the old walled building, remain open: the G. Robert Cotton Correctional Facility (JCF), the Cooper Street Correctional Facility (JCS), the Charles Egeler Reception & Guidance Center (RGC), the Parnall Correctional Facility (SMT). The City of Jackson currently assesses a 1% income tax to residents and businesses located within the city, and 0.5% for non-residents working within the city limits. The income tax provides $7,000,000 of revenue, or 32% of the city's annual budget. Jackson is 18 miles (29 km) from Michigan International Speedway. Each year the facility hosts several NASCAR sanctioned races including two Sprint Cup races held in June and August, in addition to a NASCAR Camping World Truck series race and one Nationwide Series race. The Jackson area was the home of Indy 500-winning car owner U. E. Patrick ("Pat" Patrick) and NASCAR team owner Harry Melling. Patrick Racing was formed in 1978 concurrent with the formation of Championship Auto Racing Teams (CART). For many years CART was sponsored by PPG. Patrick Racing won three Indianapolis 500s and two CART PPG championships with Gordon Johncock and Emerson Fittipaldi before the team folded in 1991. The team was revived in 1994 to test Firestone Indy car tires, and won the 1995 Michigan 500. Patrick Racing jumped to the IRL in 2004 and folded at the end of the season. Jackson area residents gave early financial support to Bill Elliott, then a promising young driver who joined the new Melling Racing team in 1982. Melling Racing with Elliott driving the Coors sponsored number 9 Ford Thunderbird won the NASCAR Winston Cup series title in 1988. Jackson County is home to Springport Motor Speedway in Springport, Michigan. Springport Motor Speedway is a state-of-the-art facility constructed in 1989 and home to the some of the finest short track racing in Michigan. The city includes two major shopping malls: Westwood Mall west of town and Jackson Crossing, formerly known as the Paka Plaza, north of town. The Michigan Department of Corrections operates several correctional facilities in Blackman Township, near Jackson. They include the Cooper Street Correctional Facility, the Cotton Correctional Facility, the Charles Egeler Reception & Guidance Center (reception center for new male prisoners), and the Parnall Correctional Facility. Jackson is served by Jackson Public Schools. The Jackson urbanized area is home to approximately 16 elementary public schools, as well as about 16 private or parochial schools. It also has a large public middle school (The Middle School at Parkside), as well as Jackson Catholic Middle School. Finally, it also boasts nine high schools: Jackson High School (Public), East Jackson High School (Public), Jackson County Western High School (Public), Northwest High School (Public), The daVinci Institute (Charter), Jackson Christian School (Private, Non-Denom), T. A. Wilson Academy (Public), Lumen Christi High School (Private, Catholic), and Vandercook Lake High School (Public). Education continues for adults who can take advantage of programs offered at various institutions of higher learning: Jackson College (formerly Jackson Community College), Baker College, Career Quest Learning Centers and Spring Arbor University. There are an additional 15 institutions all within one hour of Jackson County. As of the census of 2010, there were 33,534 people, 13,294 households, and 7,872 families residing in the city. The population density was 3,085.0 inhabitants per square mile (1,191.1 /km2). There were 15,457 housing units at an average density of 1,422.0 per square mile (549.0 /km2). The racial makeup of the city was 71.4% White, 20.4% African American, 0.4% Native American, 0.7% Asian, 1.6% from other races, and 5.5% from two or more races. Hispanic or Latino of any race were 5.3% of the population. There were 13,294 households of which 35.8% had children under the age of 18 living with them, 30.7% were married couples living together, 22.4% had a female householder with no husband present, 6.1% had a male householder with no wife present, and 40.8% were non-families. 33.9% of all households were made up of individuals and 9.7% had someone living alone who was 65 years of age or older. The average household size was 2.46 and the average family size was 3.14. The median age in the city was 32.2 years. 28.5% of residents were under the age of 18; 10.5% were between the ages of 18 and 24; 27.7% were from 25 to 44; 23.1% were from 45 to 64; and 10.3% were 65 years of age or older. The gender makeup of the city was 47.7% male and 52.3% female. As of the census of 2000, there were 36,316 people, 14,210 households, and 8,668 families residing in the city. The population density was 3,274.9 inhabitants per square mile (1,264.4 /km2). There were 15,241 housing units at an average density of 1,374.4 per square mile (530.7 /km2). The racial makeup of the city was 73.87% White, 19.70% Black or African American, 0.56% Native American, 0.51% Asian, 0.04% Pacific Islander, 1.65% from other races, and 3.67% from two or more races. 4.05% of the population were Hispanic or Latino of any race. There were 14,210 households out of which 33.7% had children under the age of 18 living with them, 35.8% were married couples living together, 19.9% had a female householder with no husband present, and 39.0% were non-families. 32.0% of all households were made up of individuals and 10.8% had someone living alone who was 65 years of age or older. The average household size was 2.48 and the average family size was 3.12. In the city the population was spread out with 29.7% under the age of 18, 9.8% from 18 to 24, 30.4% from 25 to 44, 18.2% from 45 to 64, and 11.9% who were 65 years of age or older. The median age was 31 years. For every 100 females there were 91.0 males. For every 100 females age 18 and over, there were 85.5 males. The median income for a household in the city was $31,294, and the median income for a family was $39,072. Males had a median income of $31,957 versus $23,817 for females. The per capita income for the city was $15,230. About 15.2% of families and 19.6% of the population were below the poverty line, including 26.9% of those under age 18 and 11.0% of those age 65 or over. Jackson has a number of notable historic churches, several of which were established prior to the American Civil War. The First Baptist Church was established in 1839; the present building, a Romanesque Revival structure, was dedicated in March 1872. The First Congregational Church is housed in a monumental Romanesque Revival building constructed in 1859. Its congregation has actively participated in local social reform efforts, participating in the antislavery movement in the 1840s and later supporting the temperance and civil rights movements. St. Paul's Episcopal Church was also founded in 1839. The congregation's first church building, constructed in 1840, was replaced by a Romanesque Revival building in 1853; it is one of the oldest Episcopal Church structures in southern Michigan. Constructed in 1857, St. John's the Evangelist Church is the oldest Roman Catholic church in the city. It was established as a mission in 1836 to serve a congregation that was originally predominately Irish but has since diversified to include people of many ethnic backgrounds. St. Mary Star of the Sea was established in 1881 as Jackson's second Catholic church. The present building, a limestone Romanesque structure built between 1923–26, incorporates elements of the parish's first church as well as stained glass windows, marble altars and communion rails imported from Italy and Austria. Jackson is also home to Temple Beth Israel, a Reform synagogue founded in 1862 by German Jews. Jackson was a major railway hub from the late nineteenth century into the mid-twentieth century, and for over a century has been known as the crossroads of Michigan. Today the nation's oldest train station in continous active use is located on East Michigan Avenue. It was placed on the national register of historic places in 2002. Jackson is at the junction of I-94 and US 127. US 127 is a north–south highway providing access northerly toward Lansing and Clare and southerly into Ohio. In the Jackson area, US 127 runs concurrently with I-94 for approximately 4 miles (6.4 km). It is freeway from Jackson northerly past Lansing, while the freeway south of Jackson quickly transitions to a two-lane, uncontrolled access highway. BUS US 127 is a loop route running through downtown, connecting with US 127 at either end. M-50 enters Jackson from the northwest, and exits southeast of town. M-60 approaches Jackson from the southwest, ending at I-94 west of the city. M-106 enters Jackson from the northeast and ends downtown. Reynolds Field at Jackson County Airport is the main airport for the city. It hosted commercial service, primarily under the North Central Airlines banner, until 1984. With the "Blue Goose" aircraft now gone, the airport today operates as a general aviation facility. The Jackson Blues Festival is held there annually. The 700-acre airport, equipped with an ILS system, is located just south of I-94 ( Airport Road exit #137) and is home to over 100 general aviation aircraft ranging from single engine planes to business/corporate jet aircraft. The Airport is home to many businesses including the Jackson Community College Flight School. Amtrak, the national passenger rail system, provides service to Jackson, operating its Wolverine three times daily in each direction between Chicago and Pontiac, Michigan, via Detroit. Baggage cannot be checked at this location; however, up to two suitcases in addition to any "personal items" such as briefcases, purses, laptop bags, and infant equipment are allowed on board as carry-ons. Jackson Transit Authority operates eight routes Monday through Saturday out of a central station located downtown. Greyhound Lines provides service from the JTA station. In addition to the publicly funded JTA, there are four private taxicab companies operating in town. Dan Coats – U.S. Congressman and Senator, representing Indiana. This climatic region is typified by large seasonal temperature differences, with warm to hot (and often humid) summers and cold (sometimes severely cold) winters. According to the Köppen Climate Classification system, Jackson has a humid continental climate, abbreviated "Dfb" on climate maps. ^ a b "US Gazetteer files 2010". United States Census Bureau. http://www.census.gov/geo/www/gazetteer/files/Gaz_places_national.txt. Retrieved November 25, 2012. ^ a b "American FactFinder". United States Census Bureau. http://factfinder2.census.gov/faces/nav/jsf/pages/index.xhtml. Retrieved November 25, 2012. ^ "Population Estimates". United States Census Bureau. http://www.census.gov/popest/data/cities/totals/2012/SUB-EST2012.html. Retrieved June 3, 2013. ^ "Jackson Michigan Historical Markers Under the Oaks". Albion Design. http://www.jacksonmich.com/markers/mark1.htm. ^ Scott, Sara (February 4, 2009). "Jackson-based Michigan Automotive Compressor, Inc. offers voluntary buyouts". MLive.com. Michigan Live for Jackson Citizen Patriot. http://www.mlive.com/news/jackson/index.ssf/2009/02/jacksonbased_michigan_automoti.html. Retrieved February 19, 2010. ^ "Charles Egeler Reception and Guidance Center Annex (RGC) Closed November 2, 2007"
^ "Southern Michigan Correctional Facility (JMF) Closed November 17, 2007"
^ "G. Robert Cotton Correctional Facility (JCF)"
^ "Cooper Street Correctional Facility (JCS)"
^ "Charles Egeler Reception & Guidance Center (RGC)"
^ "Parnall Correctional Facility (SMT)"
^ "Blackman township, Jackson County, Michigan." U.S. Census Bureau. Retrieved on August 13, 2011. ^ "Cooper Street Correctional Facility (JCS)." Michigan Department of Corrections. Retrieved on August 13, 2011. "3100 Cooper St. Jackson, MI 49201"
^ "G. Robert Cotton Correctional Facility (JCF)." Michigan Department of Corrections. Retrieved on August 13, 2011. "3500 N. Elm Road Jackson, MI 49201"
^ "Charles Egeler Reception & Guidance Center (RGC)." Michigan Department of Corrections. Retrieved on August 13, 2011. "3855 Cooper St. Jackson , MI 49201-7547"
^ "Parnall Correctional Facility (SMT)." Michigan Department of Corrections. Retrieved on August 13, 2011. "1780 E. Parnall Jackson, MI 49201"
^ Kurt Richard Todoroff. "Todoroff's® Original Coney Island – Treasure The Taste !". Todoroffs.com. http://www.todoroffs.com/toci/Our_History/our_history_index.htm. Retrieved May 24, 2012. ^ Greater Jackson Chamber of Commerce June 5, 2002. Retrieved on September 11, 2009. ^ Fessel, Lynn (May 9, 2006). 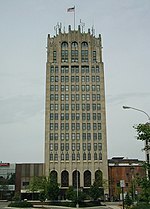 "Jackson City Council Meeting: Minutes, May 9, 2006". City of Jackson, Michigan. This page uses content from the English language Wikipedia. The original content was at Jackson, Michigan. The list of authors can be seen in the page history. As with this Familypedia wiki, the content of Wikipedia is available under the Creative Commons License.